Trent Alexander-Arnold is expected to retain his place in Liverpool’s starting lineup for this Sunday’s clash with Southampton due to Joe Gomez’s extended absence. The young defenders have often been rotated by Jurgen Klopp this season amid Nathaniel Clyne’s lengthy injury absence. Both have taken meaningful strides in their development in recent months, giving the Reds’ boss no qualms over their ability to meet his high standards. With Gomez set to miss out due to the same injury that sidelined him in last week’s 2-2 draw with Tottenham, Alexander-Arnold will get another chance to stake his claim for a stretch of games in the side. “It’s good for him that he doesn’t have to play every week. He is still a young boy,” Klopp told Liverpoolfc.com. Both have proven to be capable options this campaign and arguably been the glaring positives to emerge from Liverpool’s ever-scrutinised defence. Gomez in particular has progressed admirably and demonstrated further signs to suggest there is a future for him at Anfield in his preferred central role. His teammate has similarly been a standout feature to Liverpool’s season, establishing himself as something of an underrated attacking outlet down the right-hand side. The pair have promised Clyne a seriously tough task breaking back into the team when he eventually recovers from injury. 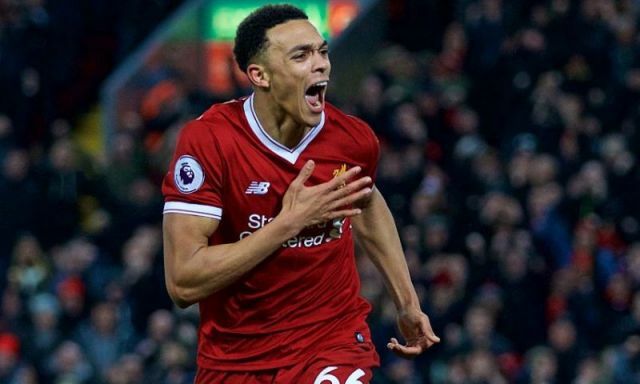 Alexander-Arnold’s inclusion this weekend will come as no shock at this stage, but the fact Klopp need not think twice about it serves as testament to how impressive the teenager has been.